At a certain point in any landscaping company’s growth, it becomes more profitable to produce mulch and topsoil in-house. Initial costs amount to capital investments that can start producing a return within just a few seasons. Even better, landscapers who produce their own soil products can avoid the inevitable bottlenecks that accompany late shipments from third-party producers. Manufacturing topsoil and mulch saves full-service landscapers both coming and going. Many landscaping jobs produce a lot of organic wastes, from clearing brush to digging out soil. You basically have two options for handling this waste: You can either cart it away, process it, and use it on the next job, or you can pay hefty dumping fees to haulers. Once you’ve processed waste materials into high-quality mulch and topsoil, you can offer these products to customers, turning a profit while charging less, since you don’t have to pay the overhead on an original shipment. A topsoil screening machine to separate usable material from rock and debris. Some models are portable, for use at the jobsite, although many landscapers prefer to truck waste back to headquarters to a stationary soil screener. Choose a tub grinder or a horizontal grinder, most of which are stationary machines. That’s actually an advantage; the benefit of installing this machine on-site is that you’re more likely to have access to electric power. Electric grinders require much less maintenance than their diesel counterparts, and they tend to run longer, too. A hydraulic Bin Tipper for filling soil screeners and mulch grinders. Landscapers can always use skid-steer loaders to pour raw materials into processing machinery, but what if none of the staff is trained to operate one during a shift? That’s when automated dumping machinery comes into play. 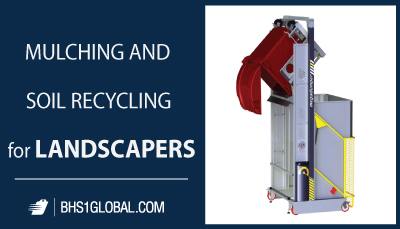 MegaDumper Bin Tippers lift and empty loads of more than 1,000 pounds, requiring only a single staff-person — and minimal training — to empty soil or yard waste into machines. Chances are, you’ve already got plenty of raw materials to turn into quality topsoil or mulch. Because hauling fees for yard waste can get very expensive for landscapers, many hold onto huge stockpiles in the yard. Tipping fees for large volumes of organic waste can easily stretch into the tens of thousands of dollars; lots of landscapers prefer to just keep building piles until they figure out what to do with the waste. Recycling yard waste into mulch and topsoil is the ideal way to turn trash into profits. Landscapers who have the capacity should give it a try. Collins, Julie. “DIY Solution.” LawnandLandscape. GIE Media, Inc., 27 Jun. 2013. Web. 20 Dec. 2018.